Our nautical base specializes in these three sports which are the windsurf, the kitesurf and surfing: "FULL WATER CONTACT" is one of our currencies. 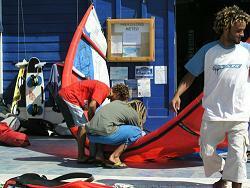 - the Nautique base is located on the beach of Essaouira at 50 M above the line of high tide. We are open 365 days annually - the safety is ensured by a boat been driven by an engine of 15 CV. 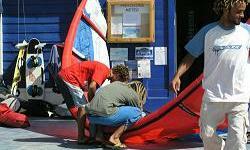 - Our instructors all are Moroccan, having a perfect knowledge their spots. Their kindness will enchant you and their motivation will still sharpen your desire for sailing.